1. Create a file of your scholarly work using any reference manager. I used EndNote for this task. Then select and export the relevant references into a text file in BibTex format. To accomplish this in EndNote, you must ‘Select Another Style …’ in the citation style drop down, and then select ‘Bib Text Export’. Then click on File->Export and save as a text file with ‘Bib Text Export’ selected as the ‘Output Style’. 2. Download, install and run Sci2 from the Indiana University website here. Do the same for Gephi from here. 3. Load the references into Sci2 using the File->Load option. Select the correct format. 4. Select the file, click on Data Preparation-> Extract Co-author Network. 6. Gephi should open up. Create a new undirected graph. You can use the Gephi WYSIWYG editor to edit the graph, add labels, change colors, increase the size of the nodes and edges based on number of authored and co-authored papers respectively. My output can be seen here. (Note that I used a Yifan Hu layout and only retained first-order connections). 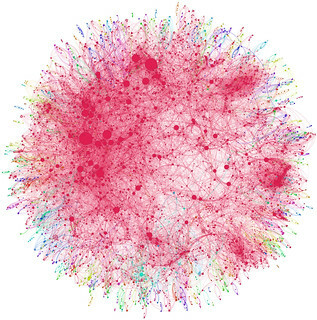 This process can be followed to create visualizations for a variety of networks, including a complete co-authorship network, citation networks, networks of Twitter followers, etc.